General Approach: The KeyBridge approach to quality assurance consists of establishing standards, performing work driven by the standards, and systematically checking to ensure that the standards are being met. In addition, conducting frequent quality-focused reviews permit us to identify areas of improvement in the products and services delivered. The KeyBridge quality program is driven by the absolute need to satisfy our clients by meeting their expectations at all times and exceeding their expectations whenever possible. To achieve that goal, each member of our SeaPort-e contract staff will be responsible for implementing the quality control actions necessary to accomplish the specifically assigned tasks. KeyBridge's Quality Manager oversees quality control from a corporate standpoint, while the PM and On-Site Supervisors monitor and ensure quality on contracts. QA Methodology: KeyBridge develops a Quality Control Plan (QCP) for each contract/TO that identifies the various processes needed to achieve the quality objectives of satisfying task requirements. The QCP is rooted in the belief that quality is the highest priority and elimination of defects produces higher operational efficiency. Through a proactive approach, our leadership trains employees to anticipate, detect, and prevent problems from occurring and eliminate problems as early as possible throughout each project life-cycle. The cornerstone to KeyBridge's QCP is KeyBridge's ISO 9001:2008 certified Quality Management System (QMS). The first-time registration was February, 2009, and the program was recertified in February 2012. The plan identifies the personnel, policies, and procedures we use to provide quality products and services; is integrated with the other operational plans; and supplements each contract/TO specific QASP. The goal of KeyBridge's QCP is to ensure that quality is incorporated into the full life-cycle of all task orders assigned. 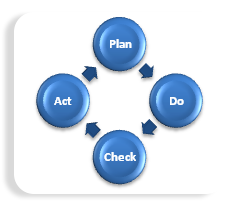 The quality cycle for any project follows a basic "Plan – Do – Check – Act" methodology and is a closed loop system as illustrated in the Figure Below. ACT: when issues or concerns arise, define Corrective Actions, solicit customer feedback, and implement follow-up systems. Our QCP provides the means to prevent and detect discrepancies, initiate timely corrective actions, and preclude schedule delays. This entire process has its basis the strong premise that service and product quality are the ultimate measures of project success. The Quality Program, therefore, includes the dynamic and continual participation of the Government customer.